Ultrasonic Level Sensor For Tanks - SILVER AUTOMATION INSTRUMENTS LTD.
Ultrasonic level sensor is a kind of sensor made from the feature of ultrasound, and ultrasonic level sensor for tanks is one kind of ultrasonic level sensors. Ultrasound is a kind of mechanical wave. Ultrasonic level sensor’s vibrational frequency is higher than sound wave, which is made by transducing chip under the encouragement of electricity, with the features of high frequency, short wave length, low diffraction phenomenon and so on, especially the good sense of direction, it can be rays to spread directly.Ultrasonic level sensor is great for liquid and solid penetration, especially in opaque solid under the sunlight, which can penetrate tens of meter of depth. When the ultrasonic level sensor encounters the impurities or the boundary surface, it will produce a significant reflection from reflection into echo, while encountering the moving objects, it will doppler effect. So ultrasonic testing is widely used in industry, defense, biomedicine and so on, in these aspects, ultrasonic wave is the way of testing. It is necessary to produce ultrasonic wave and accept ultrasonic wave. Finishing the function above is the device of ultrasonic level sensor, which customarily is called as ultrasonic transducer or ultrasonic probe. Ultrasonic level sensor for tanks combines non-contact switches, controllers, and transmitters as a suit, which is suitable for the small tank. Its flexible design can be applied to integrated systems or alternative floating ball switches, electrical conductivity switches and static pressure sensors, it can also be used in the comprehensive application of fluid control and chemical feed system. Besides, The ultrasonic level sensor is also a good choice for the application of the small storage tank of the machine, brake and other equipment. 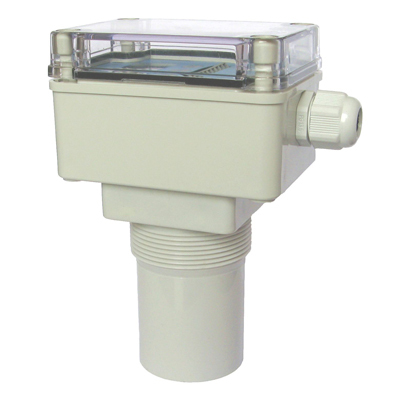 The PVDF sensor can be used in mud, corrosive media. Ultrasonic level sensors are widely used in various atmospheric storage tanks, process tanks, small tanks and small containers, pump lift stations, waste water storage tanks, etc.